Licensing laws are constantly created and revised to keep pace with developer and user needs. One source will keep you up-to-date with the information and tools you’ll need to stay on top of the latest cases related to IP licensing. 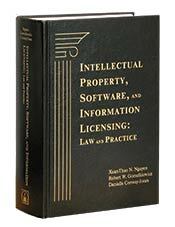 Intellectual Property, Software, and Information Licensing: Law and Practice is a comprehensive resource and accompanying CD-ROM covering all the information and tools you need to develop comprehensive licensing agreements, rectify existing problems, maximize returns within the legal boundaries, anticipate new concerns, and avoid potential pitfalls. Unlike other licensing treatises — that focus on either license drafting or on the theory of license agreements — this valuable resource draws from the authors’ wealth of professional expertise to develop a theoretical and practical balance. Intellectual Property, Software, and Information Licensing: Law and Practice is authored by Xuan-Thao N. Nguyen, JD, Professor of Law at the SMU Dedman School of Law, Dallas, TX; Robert W. Gomulkiewicz, JD, Professor of Law at the University of Washington School of Law, Seattle, WA; and Danielle M. Conway, JD, LLM, who is a Michael J. Marks Distinguished Professor of Business Law and Director of the Hawaii Procurement Institute at the University of Hawaii at Manoa William S. Richardson School of Law.